GILL, JOHN - Born Nov 23, 1697; Died Oct 14, 1771. His seminal works, the Exposition of the Old Testament and Exposition of the New Testament combined to be the first verse-by-verse commentary of the Bible by a Baptist scholar. John Gill was an English Baptist and Biblical Scholar, born in Kettering, Northamptionshire, and died in Camberwell. He attended the Kettering grammar school for a short time, became pastor at Higham Ferrers in 1718, and in 1719 became pastor at Horseydown, Southwark, where he would remain pastor for 52 years. (Charles Spurgeon would later assume this pastorate.) In 1748 he received the degree of Doctor of Divinity from the University of Aberdeen. He was considered a profound scholar and his writings were extensive. Among other writings, his Exposition of the New Testament (published in three volumes, 1746-1748) and Exposition of the Old Testament (published in six volumes, 1748-1763) forms his magnum opus. 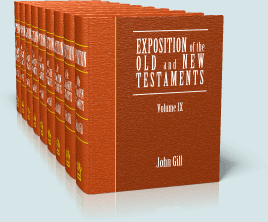 John Gill's Commentary Exposition of the Old and New Testaments is part of SwordSearcher Bible Software.